Every visitor of Paris goes to Notre Dame. And why not? It’’s beautiful and well worth the visit. But what most travelers don’t know, is that it’s wayyyy more impressive from the back. Of course you could just walk around to the gardens behind the Cathedral, but we recommend two slightly different routes. 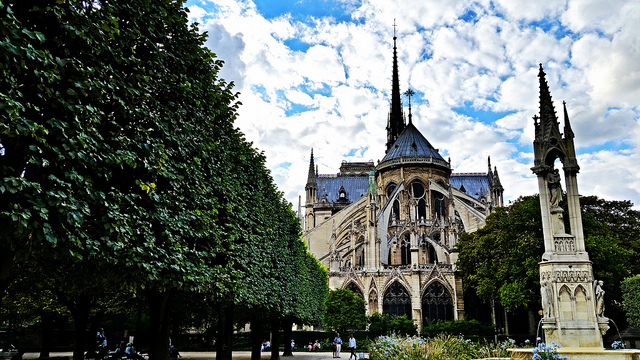 From the right bank, first walk across the bridge to Ile Saint-Louis, then make your way across the walking bridge to Ile de la Cite to see the most beautiful view of the church. From the left bank, head across the Pont de l'Archevêché where lovers go to lock it down. The cathedral is open every day of the year from 8:00 am to 6:45 pm (7:15 pm on Saturdays and Sundays).